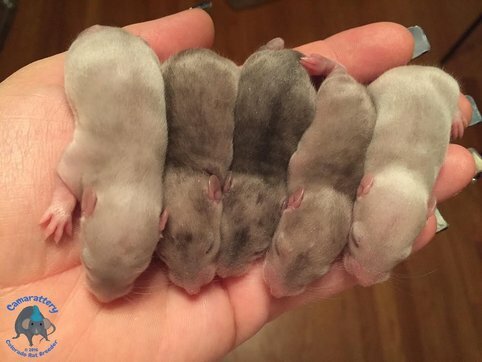 So You Want to Breed Rats? Pedigreed Rats Bred for Health, Longevity & Wonderful Personalities Since 2004! Marbles are very new to the fancy. They came from New England Reptile Distributors (NERD) in New Hampshire. When I got mine from RRRA who got them from MRR, my founding 2 were 3 generations from the NERD line. However I no longer have this line as I imported a new one from Georgian Bay Rattery in Canada. Not a lot is known about the longevity of the line since it's so new. But what is known is that they have problems with the teeth misaligning and Crypt Orchid. The CO being an issue with the testicals not droping and one or 2 of them staying in the stomach area. This is a recessive gene. 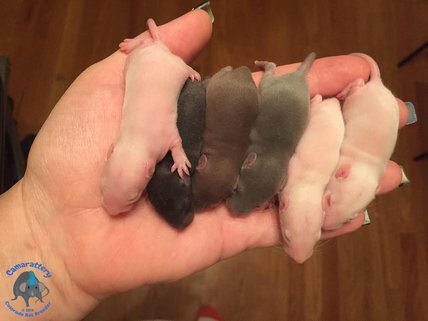 By 5 weeks old when the babies go home this is already known, and I will not allow CO babies to be adopted out, should it arise in my breedings since rats who have this are likely to develop cancer. But please note that while I will not breed from rats with tooth issues or Crypt Orchid. However, I cannot control the tooth issues from arising as the rats age. This may be an issue that arises if you adopt Marbles. Right away I will be heavily out crossing this line with my very old healthy lines to improve the Marbles. But please know that when adopting this line the health and longevity is mostly unknown. So go into it knowing that. Please note that the non Marbles in the same litters do not have the tooth issues. This seems to only develop on the Marbles rats. The Marble line seems to carry, Black, Mink, Blue and some unknown dilutes. It looks similar to the dominant Merle gene, except that Marble is a dominant gene that works on all other colors. Not just Mink based rats like the Merle. The Marble rat has Black splotches on it. And it has a dorsal stripe. Hours: Monday - Thursday 5:00 pm - 7:30 pm. I am not open on Fridays or weekends! By appointment only with at least 24 hours notice. Be sure you bring 2 copies of the contract otherwise I won't let the babies go home! Arrive on time because I have adopters every 30 minutes to avoid 2 groups at once. My address is not listed on my site. © 2004 - 2019 Camarattery. This site cannot be copied, printed, or print screened without written consent from webmaster. Any attempt to do so will result in charging you to the fullest extent of the law. This also includes printing photos or pedigrees. All images and text are property & copyrights of Camarattery.